This chapter first added 10/20/98. Research by Dan Wilson. Eightmile | Heppner | Ione | Lexington || Next Chapter . . Pioneer Menu . . Search - - Oldest presented first. Heppner was named for Henry Heppner, who along with Jackson L. Morrow, established the first merchandise store. The town was created in 1873. The destruction of much of Heppner by a flood in 1903 is one of the great tragedies of Oregon history. A photo of the flood is mounted at this link. The earliest known meeting for this group was in the summer of 1891 when Samuel B. Letson, then of Walla Walla, met with the group twice each month. The Heppner Meeting. -- Bro. Barnaby, of Dayton, and myself, have just returned home from Heppner, where we spent eleven days. Bro. Homer Gray was in a good meeting about ten days old, with 9 confessions at the time of our arrival. The interest was already good, but Bro. Gray did not feel able physically to protract the meeting further, hence Bro. B. and I were called to help. A few days after our arrival we succeeded in gathering together thirty-one baptized believers. They were duly constituted a Church of Christ, and the following persons chosen as officers of the same: Elders, Homer Gray and M. D. L. French; deacons, Vawter Crawford and C. S. Van Duyn, and four deaconesses. During the week ending March 10, there were 16 confessions, 8 by statement, some of whom were formerly Baptists. Some of these additions were of the solidest citizens of the county. Of those making the good confession 10 are men, 7 of them heads of families, 5 are married women, and 1 a girl of twelve years. Those uniting by statement are 5 women and 3 men, all of whom are heads of families. Bro. Gray, who by the way, is a good preacher himself, will probably continue to feed the flock for some time to come. 1897 building with 1909 addition at the left. The church met first at the "old wooden courthouse." Barnaby and Crawford held the evangelistic meeting in the Opera House in 1894. Mr. Crawford (see below) was noted for his musical abilities while Mr. Barnaby was the Gospel preacher. 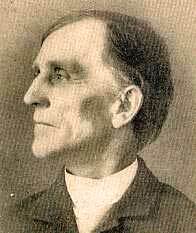 The Heppner Gazette reported that Mr. Crawford "is an enthusiastic believer in old-fashioned, whole-souled congregational singing and never fails to work up a good interest in that part of the worship . . . . "
The first vocational minister to live in Heppner may have been John W. Jenkins, an 1880 graduate of Alexander Campbell's Bethany College in Bethany, West Virginia. Church records date his ministry as beginning in 1895. He came to Heppner from planting a congregation in The Dalles, Oregon. Land was purchased and a new building dedicated in 1897 with approximately 500 people in attendance. The final $675 owing on the new building was subscribed by those attending the dedication. Early records show 113 members about this same time. 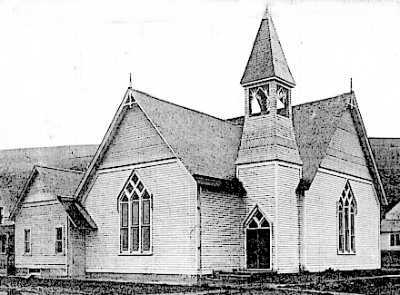 While the church building survived the great Heppner flood of 1903, it did not survive a fire 19 years later. The curved oak pews were saved, however, and a few are still in use in the present building. Jasper Vincent Crawford was the son of Philemon Vawter Crawford and Letitia Smith Crawford. They had been influenced by the preaching of Barton Warren Stone before coming to Oregon in 1851 when Jasper was 12 years old. During the years that J.V. Crawford devoted himself to the ministry of the Word, he preached in Waitsburg, Washington (1893), Enterprise (1898), and here in Heppner (1902). He spent his final 14 years here and is buried at Heppner. 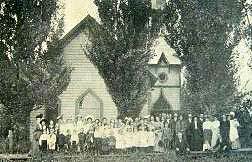 Some of the Crawford's descendents are still a part of the Heppner church. There is a separate profile of Jasper Vincent Crawford. Well-known Fern Peterson was born here in 1924. Her death was in Portland in 2004. The town took its name from Eightmile Canyon and in turn, the canyon was so named because its mouth was about eight miles up Willow Creek from the Columbia River. Historian Clarence Swander reported a church starting in Eightmile in 1891, however, the 1888 Disciples Year Book lists a chuch with 36 members. E. H. Richardson was the contact person. One Christian family living there was Franklin P. Vaughn from Frankfort, Kansas. Other members included the family of Jonathan Gerking of Umatilla County. These included son Samuel Isaiah Gerking and his wife Martha Ann Smith Gerking. There is no record of a church building, so they probably met in a school house at Eightmile. There is an entry for the Jonathan Gerking family on this link. A. M. Meldrum writes from Ione that he is holding a successful meeting there, and he indicated that a church will be organized and a place of meeting secured. Mr. Meldrum will be home tomorrow and will hold the regular services at the Christian church Sunday." The paper later reported that Andrew Mackenzie Meldrum was in charge of all the fundraising for the proposed congregation and that he planned to hire a Pendleton architect to design the building. The Athena Press article was provided by Kayla Durfee of Athena, Oregon. Early, but not necessarily charter members included such names as Brashers, Burger, Chick, Dobyns, Doughty, Engleman, Furell, Grabills, Kinney, Haines, Hymen, Jordan, Morgan, Piggott Puryear, Romania, Walker, Waters and Wilson. Presented to Elder J. V. Crawford as a token of esteem and thankfulness from the charter members of the Church of Christ at Ione, who are deeply grateful for his services, sweet-spirited fellowship and fatherly advice, which have contributed so much to the planting of the primitive gospel in our midst. There were 25 charter members. By 1913 the membership had grown to 86 members. The new building was dedicated in 1914. It was at the southwest corner of Main and D Streets. The Congregational Church was in the same position two blocks to the west. In later years, the two congregations merged to form the United Church of Christ. The Christian Church building was used by the combined group. 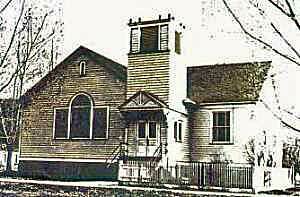 Our thanks to Paul Clay, pastor of the Ione United Church of Christ, for providing information and the photo of the old Ione Church of Christ building. The Lexington Church of Christ was organized in 1915. The group first met in Leach's Store and then in 1918 purchased the Methodist Episcopal building. Early, but not necessarily charter members included such names as W. F. Barnett, Stephen H. Doak, T. L. Dorman, Frank Evans, Riley Monkers, M. F. Parkers, James Pointer and Maude Cutsforth Pointer. The Congregational Church pictured at right merged with the Church of Christ in the 1930s and the name was changed to the Lexington Christian Church. C. F. Swander, in his 1928 history, lists these additional Morrow County Churches: Alpine, Blockhouse, Gooseberry, Irrigon, Liberty Schoolhouse, South Springs, Strawberry and Pine City.